Dandelions are a winter perennial and arrive in mid Spring and then again in mid Summer. Protocol for controlling Dandelion is the use of a good pre emergent and post emergent. Also, aerating and overseeding your lawn will help by creating a thicker, healthier lawn. Crabgrass will typically start to germinate in late April to early May. It all depends on the temperature of the soil. Protocol for crabgrass control is the use of a pre emergent in February or March. For the best control, another application of pre emergent is applied in April. Any Crabgrass that has germinated can be treated with a good post emergent. Wild Violet is winter annual that appears in between March and June. Post emergent herbicide applications in the Fall seem to be the most effective way to control Wild Violet. Since Wild Violet thrives in acidic soil conditions, Lime applications will be helpful as well.  Spurge is a Summer annual that typically is found in areas of your lawn that are compact or have high traffic. Core aeration and over seeding your lawn will help control the growth of Spurge. Pre and post emergent herbicides are use as well. Oxalis is a Summer annual that can be a perennial some years. Oxalis will typically grow in bare, thin areas of the lawn, so using core aeration and over seeding along with a good pre emergent herbicide will help control Oxalis (this is also applies to Black Medic).  Lespedeza is a Summer annual and is most prevalent in bare, thin areas of the lawn. A good pre emergent application in the Spring, along with a post emergent application in the Summer is effective in controlling this weed. Nutsedge is a summer time annual. Sedge is not a grassy plant. It is most predominant in areas with poor drainage . Nutsedge root system consists of tubers and a typical tuber can produce up to 2,000 new plants. Common pratice is to use a selective herbicide to control this plant. A warning, do not pull sedge from the ground. Doing this will triple the spread of this plant.  Johnson grass is a perennial grass that shows up in late Spring. A very hardy grass, Johnson grass is very difficult to control. Repeated applications of a selective pre emergent along with repeated applications of a selective post emergent are necessary to control this invasive grass. Clover is a Winter perennial, that will show up in the Spring. A pre and post emergent herbicide is effective in controlling this plant. Most Clover infestations occur on hard, compact soil or in high traffic areas of the lawn. Core aeration and over seeding will help as well. 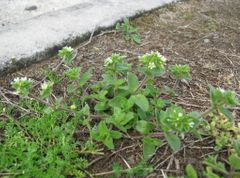  Chickweed is a winter annual that will show up in the Spring. A timely pre emergent application followed by a post emergent application is commonly used to control this weed.